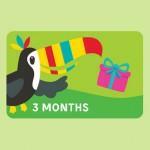 A toucanBox Gift Card is for 3, 6 or 12 monthly toucanBox deliveries for your favourite little artist. Each delivery contains two craft activities and the latest issue of toucanBox magazine, plus easy-to-follow illustrated instructions and a sticker sheet. 3. Recipient redeems the gift code to start the subscription! The Welcome Pack contains a t-shirt to colour in and is posted to the delivery address provided on purchase. E-Gift certificate containing gift code will also be emailed to you to forward or hand-deliver. Please note this won't be instantaneous, but after a few days when toucanBox have processed your order. Please note: Purchasing the gift card does not automatically begin the subscription. The gift code will need to be activated by the recipient for the subscription to begin. The toucanBox Gift Card expires 12 months after purchase after which the card will become invalid and no longer available for use. 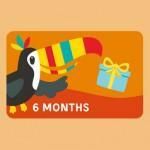 toucanBox Gift cards are non-refundable and cannot be replaced if lost or stolen. toucanBox Gift Cards cannot be redeemed in whole or part in cash nor may it be used in conjunction with any other offer. Be the first person to tell us what you think about toucanBox Gift Cards and you'll save £2.50 on your next purchase! A welcome pack with a gift code will be sent to the recipient, who redeems the gift code to start the subscription!